Izzy freaking out over the Darcy news. Lyn informing Susan that Izzy doesn't love Karl. Susan wanting to talk to Karl about Isabelle. Susan asks Karl if he's really happy and if marrying Izzy is what he wants. Before she can get herself too wound up, Karl reassures her that he's fine and that he loves Izzy. His mobile rings and it's Izzy who's in a large state of panic. Susan goes up to the counter to leave Karl be. He dashes out to wherever Izzy is calling from while Susan slightly agonizes over not telling him the truth. The Hoylands' are busy getting ready with Lyn flitting around. Spy Cam can be seen peering into the house – someone is keeping an eye on them. Creepy. Steph and Summer make their way out to hang with Izzy but before they go, Lyn senses a Kodak moment and gets a picture of them all. Summer wonders why Nana Scully isn't getting ready but Lyn says she has to stay home and look after Charlie. Izzy bursts in all distressed, with her hair in rollers and still wearing her day clothes and ugh boots. She tearfully tells them that her reception place got flooded. Lyn mutters that she'll have to cancel. Izzy evil eyes her and says Karl will take care of it. Max takes her into the kitchen to find some reception venues in the Yellow Pages. Harvey is barking at the kitchen window so Steph takes him outside, saying he must feel the tension in the air. Max reassures Izzy that Karl will find somewhere for them. David is trying to scrub some graffiti off the front door – Stingray and Lana spray painted ‘Peace' on it on their artistic rampage the day before. He's not impressed. Harold wanders out wanting Lil to help him with a message on the wedding card. LIL: Wedding card, lets see, um… Ooh, I know. How about, ‘Good luck with your divorce'? David answers the phone while Lil and Harold chat. Harold wonders why she's even going if she's so against it and Lil says it's hard to say no to an invitation to your boss' wedding. Harold says that Izzy is a nice young woman and her and Karl deserve a chance at happiness. “Yeah I know, just like Susan and Karl did,” Lil snipes back. David informs everyone that Lee Thomas will be there next week all the way from Idaho. Harold gives David a knowing look when Lil leaves the room. Dave says that Lil need to be none the wiser about Lee's gender. “Foolish David, very foolish.” Lil flits back out and says to make up for her lack of respect before she wants David to invite Lee to stay with them while he's there. David looks uncomfortable with that thought as we pan back to the front door closing and the ‘Peace' sign focused on. Karl arrives to save the day only to have Izzy tell him to not look at her because it's bad luck. He averts his eyes and tells her that every single place is booked solid. Izzy speaks in fast forward and yammers on about checking the Italian restaurant in Eden Hills and then wonders about Lassiter's. He admits he hasn't checked there yet and goes to call them. Lyn hands him the phone. KARL: I doubt they're available, Lyn. LYN: Yeah, well, for Susan's sake I hope they're not. David is trying to convince Lil that Erinstown has probably covered all the expenses already but Lil thinks Lee would be much more comfortable in a home environment. Harold calls out from the computer in mock innocence, “Goodness me, where did that come from?” He's referring to a picture of Lee Thomas who Lil discovers is a woman (or a mighty pretty man). David says he can explain and Lil queries that, saying that there's only one explanation she can think of for this. Izzy cheers when Karl tells her that Lassiter's is free. He doesn't look overly happy though. Izzy gets Boyd and Max to ring the guests and tell them about the change of venue and Steph and Summer to help her shift all her stuff over to the hotel. Lyn walks up to Karl and says that at least Izzy's happy, “that's the most important thing…” Karl looks conflicted. Izzy excitedly prances about the place while Karl mopes behind her. She asks why he doesn't look happy and he gently tells her that he and Susan renewed their vows at that exact place a couple of years ago. Izzy can't see the problem but Karl asks if it would be the end of the world if they just postponed the wedding for a day. Cue Izzy meltdown in 5, 4, 3, 2, 1…. IZZY: Are you kidding? Oh my God! I can't believe you're doing this after all that's happened. You're doing this now? I want to get married today. Karl tries to reassure her that he still does want to get married while the Spy Cam lurks behind them at the front entrance. She goes off in a huff to the dressing room leaving Karl standing there. Spy Cam turns out to be none other than Gus Cleary, looking peeved. Karl tells Izzy he's doing this for her benefit and asks her if she really wants to walk down the aisle in Susan's footsteps. Izzy tells him that if she stopped doing things because Susan had done them before her she may as well stop living. Karl says he knows how hard it's been for her but Izzy's not so sure. IZZY: No Karl, losing the baby was hard. Having your ex-wife and daughter treating me like some pond scum, that's hard. Karl is trying not to get frustrated and follows Izzy out to the main room as she walks out in a tizz. She says that on top of all of that she's still having nightmares about Darcy. Karl says that whatever she wants they'll do. The Hoylands' arrive with all the wedding things and Izzy turns to Karl for a sure sign that they're continuing. Karl puts his cheerful face on and everything resumes as per normal. Izzy thanks him and he says as long as she's happy, he is. Lyn arrives at the door with a box of choccies for some “good old-fashioned choccie therapy”. She adds that before they close the topic once and forever she thinks that Susan is handling the wedding really well and she's proud of her. Susan laughs and admits she nearly warned Karl off before. SUSAN: He's been such a big part of my life I didn't think I could watch him marry into unhappiness, but hey! I guess I can! LYN: Like, it's not your responsibility, is it? SUSAN: Oh and let's face it, who'd believe me anyway? It would just sound like sour grapes, they'd be waiting for me to boil a rabbit next. Lyn giggles and says that if she weren't a little bit jealous she wouldn't be human. Susan looks a bit unsure about that. Steph and Summer put the finishing touches on Izzy's dress and tell her she looks stunning. Steph realises she left the flowers in Lyn's fridge and takes Summer with her to get them after Izzy says she'd like a bit of alone time. She's sitting at the dressing table looking into her make-up bag when Gus suddenly appears behind her. “I always knew you'd make a beautiful bride. You look like an angel.” Izzy jumps out of her skin and wants to know why he's not in hospital. He says he heard about the wedding and he had to come and see for himself. Izzy acts all nonchalant and pretends that Karl's just outside but Gus is on to her and knows Karl's getting ready elsewhere, he's been watching their every move all day long. He takes her hands in his. GUS: He doesn't deserve you. He doesn't understand you, not like I do. But I'm back now and it'll be just the three of us. You, me and the baby. I've got it all worked out. IZZY: The baby died, Gus. There is no baby. GUS: Oh I'm sorry. Poor Izzy, it must have been so hard. But I can make it up to you, we can have a new baby. GUS: You're just upset because of what happened last time, things got all mixed up. But it's better now. I'm here to make it up to you. GUS: You'll never be happy with him, Izzy! I'm the only one who knows the true you. IZZY: [yelling out] Help! Security! Somebody help! GUS: You're mine Izzy no matter what. You remember that. He kisses her and runs out just as security burst through the other door. She is suitably repulsed and upset. 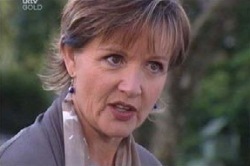 Susan says to Lyn that she's really not jealous of Karl and Isabelle. She does love Karl still, just not in the way that she did before. Susan realises that she's dragging the mood down and suggests they go to Lassiter's so that she can buy Lyn a cocktail. Lyn baulks at this suggestion and admits to Susan that the wedding got moved there earlier. Suse looks gobsmacked. Dave is still trying to explain himself to Lil while Harold and Lou look on in amusement. DAVID: I was convinced she was a man till just last week. LIL: Really? Do you want me to check all your emails? She lets him off the hook though and says she's not about to divorce him over a couple of flirty emails. Dave is relieved. “You're lucky I do think it's funny, lover boy,” Lil tells him. “A lot of wives wouldn't.” She still wants Lee to stay there as well (for the squirm factor from David I think). Harold and Lou thank them for the pre-wedding entertainment. Susan is lugging a suitcase to her car whilst on the phone to Lib. She's going to stay at her place for a while just to escape the madness. Lil walks over and asks how she's coping. Susan says she's fine but she seems a bit distressed. David yells out for Lil to hurry up and she tells Susan she's thinking of her. Max stops Karl before he can get to Izzy. He wants to check on her after what happened with Gus but Max says he won't do any good going in there all wound up. He adds that they've got security covering the place. Boyd says to his dad that Gus could still be around there somewhere and that he should check the car park. Max says Boyd's not going anywhere and makes him promise he'll stay where he knows he'll be safe. Susan calls Lib again to tell her that she'll be a bit later than she thought. She drives down the street and gets on her way. Karl reassures Izzy that Gus won't get to her again. Izzy sobs that she thought he was gone and that he was never coming back. Karl holds her hand and says that he's not going to let floods or famine or Gus get in the way of their wedding day. “Because I love you Isabelle Hoyland. I love everything about you, and I cannot wait for you to be my wife so I can spend the rest of my life giving you all the happiness you deserve.” Steph steps in and says to Karl that the celebrant's asking for him. He kisses Izzy on the hand and says he'll see her at the altar. Izzy looks like she's going to burst into tears again. Summer is getting rid of the lint on Karl's suit with a brush, saying that she feels sick. This is the first time she's been a proper bridesmaid and she's more nervous than Karl. Max comes along and asks if Karl's ready. He says yes so Max goes to get Izzy. Max finds Izzy and says there's a bloke out there who reckons he wants to marry her. Izzy gets startled and half-heartedly asks if he's good looking. Max does the proud brother routine and says she looks beautiful. The wedding song begins and Max turns to take her arm when she changes her mind. She wants to meet him around the front so they can make a grand entrance. He agrees and says he'll see her there in a minute. Meanwhile, Karl is nervously waiting in front of all the guests. He goes to the door to check on what's happening. Max and Steph say Izzy said she'd be right out. Steph goes to find her. Karl hopes it's not Gus but Max doesn't give him a very reassuring look. Susan is driving along on her way to Lib's. Izzy is driving in the opposite direction, still in her wedding gear. Suddenly a car backs out of a driveway in front of her and she swerves not to hit it, and also not to hit Susan's car that appears in from the other side. Luckily no one gets hit but Susan can't believe who's in the other vehicle. She gets out and goes over to Izzy's car, opening the door to see if she's okay. Izzy just sits there looking vague, eventually getting out of the car. Susan is surprised to see her in her wedding dress until she figures out what she's done. SUSAN: You're leaving, aren't you? You led him all the way to the altar and you just leave him there waiting? How could you do that? SUSAN: You've never thought of anyone in your life except yourself. He sacrificed everything for you and you do this? SUSAN: You know what, you're right, Isabelle. Do him a favour of a lifetime, just keep on driving and don't ever, ever come back. Susan storms back to her car and gets in. “He deserves better,” Izzy says out of earshot from her. Susan drives away in one direction and Izzy does the same in another.